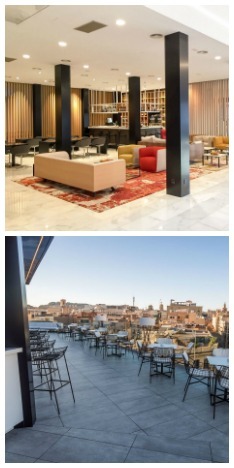 Located in the heart of the city of Barcelona, the Hotel Negresco Princess’ project began with the conversion of a former office building, an icon of 1970s architecture, located in one of the most characteristic corners of Barcelona’s Eixample district. Within a few steps from Plaça Urquinaona, Plaça Catalunya and Passeig de Gracia, Hotel Negresco Princess is located at Roger de Llúria 16-18. This privileged location makes it the perfect choice for visiting Las Ramblas, Barcelona’s Cathedral, the Gothic Quarter, La Pedrera, Casa Batlló and shopping at the best boutiques in Passeig de Gràcia. Central, urban and minimalistic, the Negresco Princess opened its doors in December 2015. The imposant avant-garde atrium, 128 welcoming rooms, relax areas, gym, terrace with privileged views, solarium and infinity pool will make your stay unforgettable. As a plus, the great food offer at Restaurant “The Corner by Princess” in the lobby area and the “Bar Terrazza” on the 7th floor. Cool and cosmopolitan, Hotel Negresco features a free minibar in every room and free Wi-Fi throughout the hotel. This hotel has no meeting rooms available.